Okay, I know this is not from SDCC 2017, but Disney's D23 Expo happened just a week earlier, and this is the only good thing that came out from it (in terms of trailers/clips). That being said, it is indeed really good. It is a behind-the-scenes video, but you really get the feel from it. Some of the images that they show are really cool, and there are some funny remarks (like the one from John Boyega) and some very inspiring ones, too (like from Carrie Fisher). And the music that accompanies it is really awesome, and fits perfectly to the tone of the montage. First off, Bright is a movie that will be released immediately on Netflix in December. Personally, I am not that keen into this film, but it does look pretty interesting and has a great cast. Meanwhile, if I have to pick the product that I am interested in most, it would be The Defenders. But the trailer is not that great. It's decent, but its nothing to rave about. Finally, Star Trek: Discovery actually looks very cool & has a pretty good trailer. I was initially concerned about a Star Trek TV series, but thanks to the involvement of Netflix, it received a high budget (for TV) which allows the special effects to be done so brilliantly well. It really looks good. Now I know that there are a lot of DC trailers (Arrow, The Flash, Gotham, etc) that came out...but I have to admit that I am no longer following any of them. Unfortunately they feel too repetitive and I have lost the interest in watching them. Meanwhile, these shows (Inhumans, The Gifted) are new shows, so obviously I am interested and will give them a chance....whether I ended up liking it or giving up on them is another story. Also, before I have DC fanboys shouting at me, I need you to know that I have given up on Agents of SHIELD long before I had given up on the CW shows. Now in terms of the above trailers, I have to say that I am just borderline interested in Inhumans. The trailer actually doesn't look that good, and I'm not too sure how the show will be. I am still interested, but I am cautiously optimistic with the quality of the show. On the other hand, initially I was very skeptical about The Gifted, but this trailer is really awesome! It looks very cool, and I like some of the characters involved (Polaris, Blink). And with Bryan Singer directing the pilot, I am now really quite interested in this show. The trailer is pretty cool, but it didn't add too much excitement for me. Partially, it might be because I am already sold on the film, anyway, but its also partially because the trailer is not great (decent, but not spectacular). Marvel Studios may have released a bunch of videos in the panel itself, but the only one released to the public/internet is the new trailer for Thor: Ragnarok. And I have to say, I kind of enjoyed the trailer and where they are taking this film. 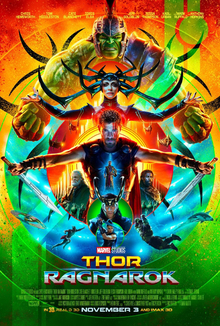 I still admit, deep down, I would rather have a dark Thor movie (I mean, the title is Ragnarok, for God's sake). That being said, I really like everything that I have seen so far, and I am super excited to see this film now. Even the trailers themselves are already enjoyable to watch on their own. Everything that I have heard about Ready Player One is nothing short of exciting. A great premise based on a great novel. Directed by Steven Spielberg, scored by Alan Silvestri, and includes an array of great actors (Ben Mendelsohn, Mark Rylance, etc). But the trailer wasn't very good. In fact, I was quite disappointed by it. The visual looks pretty cool, but the overall trailer quality was poor. On the other hand, the winner of the best trailer of SDCC 2017 has to be Justice League. The trailer is 4 minutes long, and it is awesome! The glimpses of the villain is pretty cool (and that voice is super menacing! ), and the whole trailer contains some very cool shots and exciting action sequences. I am still not totally into the jokes from Barry Allen (The Flash), but save that, this whole trailer is spectacular. Even the music in the trailer is just epic! And if we're getting into some of the details, I like the the fact that the villain mentioned 'No Lanterns' as reference to the Green Lantern, and of course, we can only guess who that mysterious individual was at the end there. But, as a trailer, it is a very good trailer with cool shots and great music. It is easily the best trailer of SDCC 2017!